The harmful effects of exposure to tobacco smoke have been known for many years. 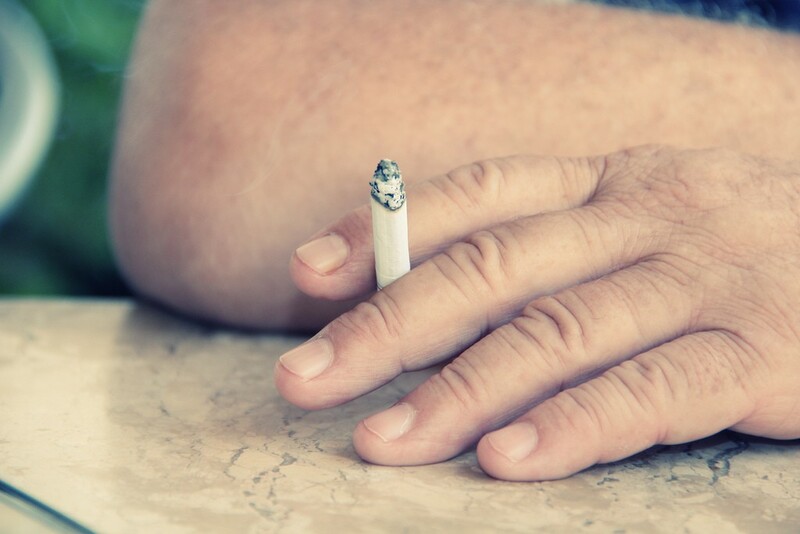 Cigarette and cigar smokers are at significantly higher risk of contracting all sorts of respiratory maladies, and research linking secondhand smoke to cancer goes back nearly three decades. But what about the chemicals that stain the walls, ceilings, carpet and upholstery in rooms in which tobacco has been smoked? What about the lingering nicotine on the fingers of smokers? Is there something dangerous in the residue that lingers long after the smoke clears? Researchers at Cincinnati Children’s Hospital Medical Center and the University of Cincinnati have found more evidence of the potentially harmful effects of exposure to the residue and particles left behind by tobacco smoke. In “Nicotine on Children’s Hands: Limited Protection of Smoking Bans and Initial Clinical Findings,” published Jan. 16 in Tobacco Use Insights, Cincinnati Children's attending physician Melinda Mahabee-Gittens and UC assistant professor Ashley Merianos found that not smoking around children doesn’t stop the children of smokers from being exposed to nicotine. They also found that that higher levels of exposure to tobacco smoke residue — which likely includes carcinogenic tobacco-specific nitrosamines — may be linked to respiratory problems. “It just goes to show that indoor smoking bans don’t necessarily protect children from tobacco smoke exposure and related pollutants, such as thirdhand smoke,” says Merianos. 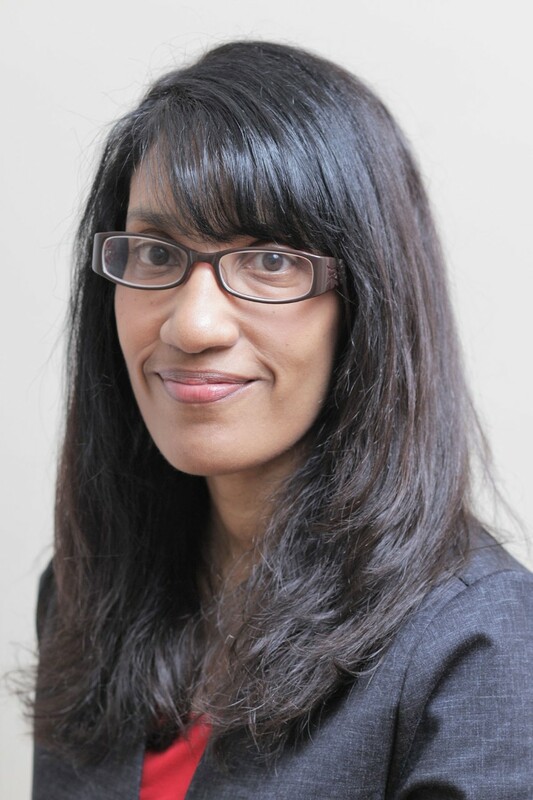 “It also shows that exposure to tobacco smoke toxicants is more widespread than previously thought because exposure in children is not limited to inhaling secondhand smoke,” adds Mahabee-Gittens, who is also a professor of pediatrics at the UC College of Medicine. Urban Health is a key pathway in UC's strategic direction, Next Lives Here. Impactful research of this kind plays a key role in unleashing UC's vision to lead public urban universities into a new era of innovation and impact. Research staff collected wipes of the dominant hands of 104 children visiting the Cincinnati Children's Pediatric Emergency Department between April 2016 and August 2017 with complaints potentially linked to tobacco smoke exposure and who had at least one caregiver who smoked. The handwipes were then analyzed for nicotine. 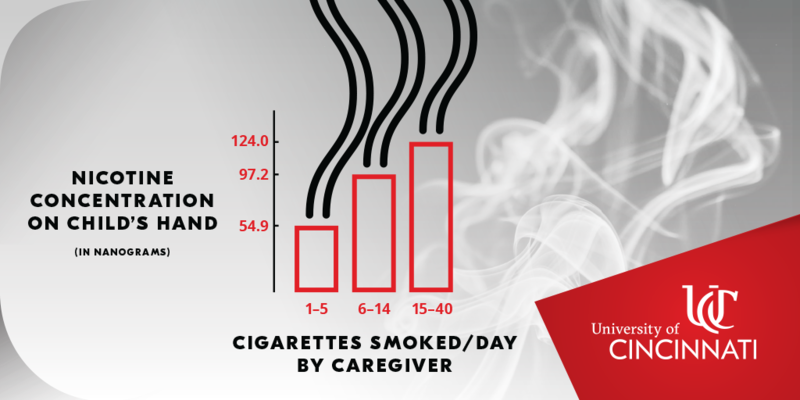 The research explored several variables, including the self-reported smoking behaviors of the children’s caregivers, as well as the number of smokers living with the child, the number of cigarettes per day smoked by caregivers, the number of cigarettes smoked around the child in any location (such as in the home and the car) and the number of cigarettes smoked around the child inside the home. The research also looked at the medical records of the children for possible smoke exposure-related complaints such as wheezing and cough, as well as past medical histories and discharge diagnoses. The study found significant levels of nicotine on the hands of children of smokers whose caregivers did not smoke in their presence, averaging 82 nanograms (ng) of nicotine. A similar amount was found on the hands of children whose caregivers smoked between one and five cigarettes per day in their presence. Children whose parents smoked 15 or more cigarettes around them had nicotine levels on their hands in excess of 200 ng. More than half of the children in the study were under 2 years old. Children in that age group averaged about 69 ng nicotine, while children between the ages of 2 and 4 — who accounted for 25 percent of the children studied — averaged nearly three times as much (185.6 ng). Children ages 5 and over were found to have only slightly more nicotine on their hands than the children under 2. “Future work should explore the associations of hand nicotine and age to determine how children’s changing interactions with their environment and behaviors contribute to increased nicotine in 2- to 4-year-olds, whether handwashing decreases the risk and whether increased levels are associated with increased [secondhand smoke-related] clinical illnesses,” according to the research article. Children whose caregivers smoked five or less cigarettes per day had an average of about 55 ng nicotine on their hands, while children whose caregivers smoked 15 or more per day were found to have an average of 124 ng nicotine on their hands. Children with higher levels of nicotine found on their hands were significantly more likely to have respiratory symptoms such as wheezing and coughing, Merianos says. Merianos advocates for caregivers to quit smoking to decrease the exposure of children to nicotine and smoking-related chemicals. For those who do not quit, she recommends handwashing, showering and changing clothes after smoking to minimize thirdhand smoke exposure. Mahabee-Gittens adds that parental smokers should know that these measures alone are not enough to protect their children since deep-seated reservoirs of toxicants continue to build when smoking continues. The researchers will continue to study the issue to see if the results are replicated with a larger sample of children. Cover image by Victor Carilo/Flickr. The University of Cincinnati is classified as a Research I institution by the Carnegie Commission, and is ranked in the National Science Foundation's top 35 public research universities. UC's graduate students and faculty investigate problems and innovate solutions with real-world impact. Learn more about advanced degrees at UC.